Picture this: Your own secluded mountain chalet, with a private hot tub, a fireplace, privacy, luxury and the most spectacular views! What more could you ask for? The Peak is situated on the western slopes of the Blue Mountains; less than two hours from Sydney yet an eternity away from the hustle and bustle. This exclusive and private retreat provides the perfect destination for a romantic honeymoon, an anniversary or special occasion, or to simply escape and unwind. This is the perfect luxury escape for romantics and for celebrating that very special occasion, whether it be your wedding anniversary, your honeymoon or a milestone birthday. Two identical, luxuriously appointed and secluded chalets, complete with hydrotherapy hot tub spa, fireplace & panoramic views. Self-contained & private. This listing is for the Eagle chalet. although if booked out, you may wish to inquire directly for the Wallaby chalet. * private and secluded setting - no neighbours! Share the spectacular views with native wildlife such as kangaroos, wallabies and eagles. Relax in your private spa, arrange a massage in the privacy of your chalet or take a bottle of wine up to the trig point. Alternatively, enjoy the many Blue Mountains attractions and adventure pursuits such as bushwalking in the Grose Valley, sightseeing in Katoomba, caving at Jenolan Caves, golf, fishing, riding, abseiling and local galleries. Maybe there is a reason why people want to stay longer. Please note that a minimum two night stay is required for all bookings. Past guests will agree that even 2 nights is not enough! During Christmas, Easter and public holiday weekends, a minimum 3-4 night stay is required. ** Special honeymoon and special occasion packages available directly. ** More pictures, packages and information on our website - google us! "A big thank you for your kind hospitality. Our wedding night, as well as New Years Eve celebration could not have been more memorable." "What a wonderful place! 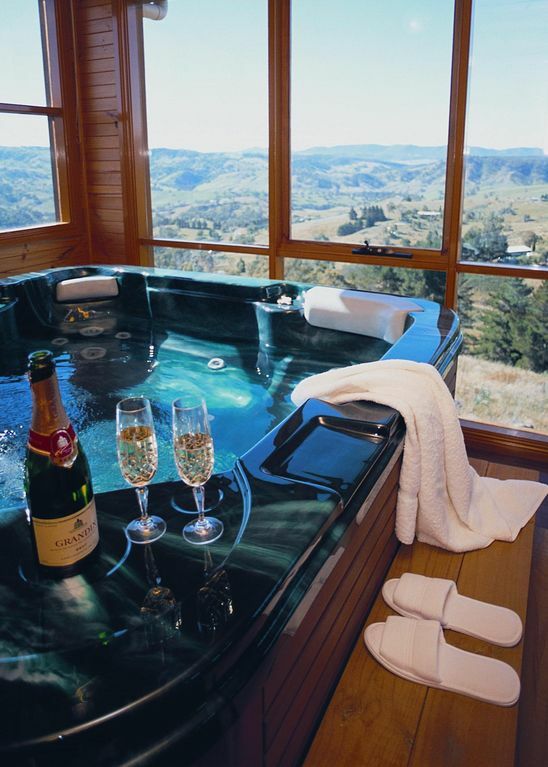 We have thoroughly enjoyed the view, the hot tub, the peace & quiet and the luxury! 360 degree views over the Blue Mountains from "The Peak's" peak are breathtaking!" "We could not have picked a more perfect spot on earth. The view, the attention to detail, the entire place was great. " "A perfect retreat - a wonderfully relaxing and romantic weekend. Lots of extra touches made it really special. Thank you." "Sensational! What an absolutely fabulous location to take a break and chill, and spend our 6th anniversary. The spa, the cabin, the vista - all wonderful! " "Picture perfect setting in a beautiful cabin. Your attention to detail is greatly appreciated. The best spa we've had in a room ever!." "Thank you for such a beautiful getaway!!! One we will remember always." THE HOSTS WERE VERY FRIENDLY,THE CHALET WAS PERFECT.WARM,COSY VERY CLEAN AND TIDY.EVERYTHING YOU NEEDED WAS CATERED FOR.PEACEFUL AND QUIET. The Egale Chalet at the Peak was excellent just like the web site. The views were breathtaking and the jacuzzi was perfect. What a wonderful place to celebrate our 20th wedding anniversary. The goodies left for us were a beautiful suprise. The breakast provisions plus the warm loaf on our first morning was amazing. Loved it, loved it, loved it!! This is one of the most exceptional forms of accomodation. There is nothing missing in any area. I cannot speak highly enough about our experience at &quot; The Peak&quot; at Mt Kanimbla and will be returning as soon as possible.Comfort, Quality, Privacy, Peace and Serenity. Luxury Personified.